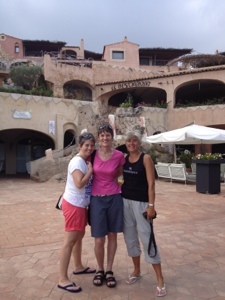 After a very windy night at anchor, we took the dinghy into Porto Cervo. The playground of the rich and famous was devoid of the rich and famous and was replaced by a bus load of tourists who were disinclined to have to pay €30 for a gin and tonic and €16 for a toasted sandwich. Most of the shops were closed or, if they were open, didn’t have prices! We decided to return to Nimrod and have lunch on board. We motored into the nearby La Maddalena Archipelago, which is a protected national park. 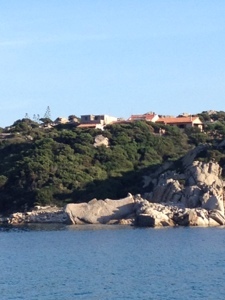 We anchored in a small bay called Cala Spalmatore on Isola La Maddalena. It has a nice beach with clear turquoise waters and until around 1800 we were the only boat. We spent the relaxing and snorkelling around the rocks where we saw huge clams. Another evening on board but at least the wind is light so we should sleep soundly. 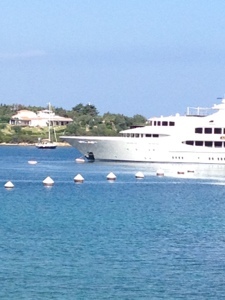 Pictures below of Nimrod next to one of the super yachts, Caron, Yvonne and Liz in Porto Cervo and Cala Spalmatore. Why didn’t you collect the clams for dinner ?? I am sure there are lobsters lurking in the rock as as well. loved the rich yacht didnt you get to call on them?